SEOUL - Turner International Asia-Pacific and YBM Education, South Korea's largest English education institution, launch of the world's first CNN-branded cafe in South Korea. The new CNN concept 'coffice' (coffee-office) offers customers free wi-fi, computers and printing services, and features CNN content across different platforms, including a live feed of the CNN International channel on a large screen, the latest CNN newswires on a digital ticker and computer terminals featuring cnn.com and cnngo.com. 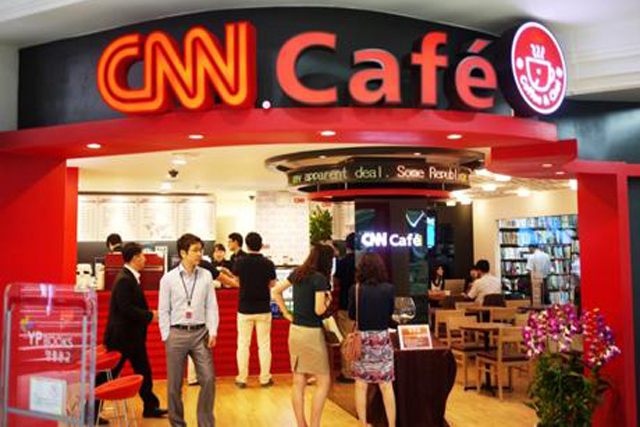 "CNN Café is not just another coffee shop, but an information hub for locals to get the latest international news from CNN, as well as a chance to learn English in a more comfortable, relaxed environment," said Ron Lee, senior vice president and general manager of Turner Entertainment Networks Korea. It also provides a chance for locals to learn English using YBM’s various study-oriented features, including free study abroad consultations, language consultations and TOEIC test registrations provided by YBM instructors at set times at the café. The CNN Café is located inside the Jongno branch of the Young Poong Bookstore. Further locations are set to open throughout Seoul and across South Korea.